I can't ride my Sprint, and haven't really been able to for a while-- my shoulder is sufficiently fucked up that I can't put weight on my arm for very long, and I can't hold my arm forward for any length of time. This rules out riding 99% of motorcycles on the market, and I've sat on lots of different bikes over the past year. 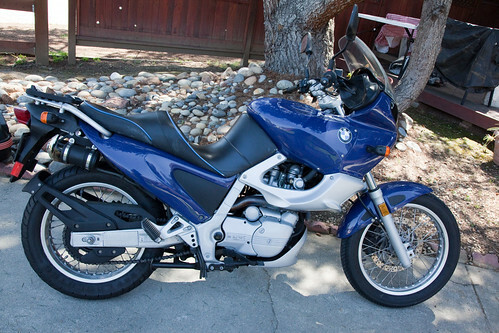 The only thing I've found that will give me an acceptable riding position is the BMW F650 series. A few days ago I decided to scan Craiglist to see what was available, and spotted this one. It's lowered, which is a win for inseam-challenged me. It's fairly light. And it's reasonably priced. I went down to San Jose yesterday and went over it with a fine-toothed comb... well, actually, a flashlight and latex gloves. (No, really!) After a quick consultation with my mechanic, I bought it. Wednesday night I'll go down to pick it up.